// Between the lines //: The cutest tutorial ever! I have a very special guest today, my sweet, big girl M. .
With an interview and her tutorial for a cute finger puppet. Both the tutorial and the puppet were part of my birthday present. 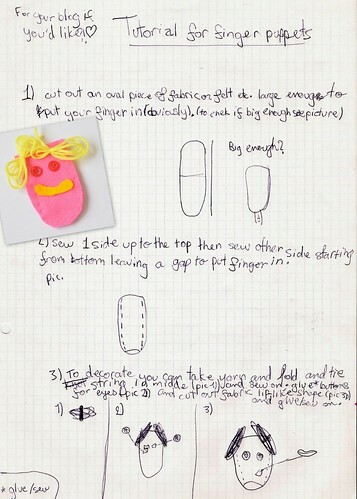 // BTL // : So, M., tell me, where did you get the idea of making a finger puppet? M.: Deep down in my craft thinking area, the craft section in my brain! // BTL // : Does everyone have a section like that, you think? M.: No, only original people do! // BTL // : Hmm, I see... And why a tutorial? M.: So that people who like my work can make it! That's what blogs are about, not? // BTL // : Some blogs, yes. So, you knew all the time that I would put it up on my blog?! M.: Well, actually, I was hoping so but I also made it for fun and because it was your birthday! // BTL // : Are there any other craft activities you like? M.: Yes! Sewing, drawing and inventing! // BTL // : The best thing you ever made? M.: My pyjamas pants! My bag! The Super Teacher collage for my teacher! // BTL // : Any other things you like to do? // BTL // : Thank you for your time, my sweet M.! M.: You're very welcome!... I hope I'll invent something again soon, so I can come back! // BTL // : Me too!